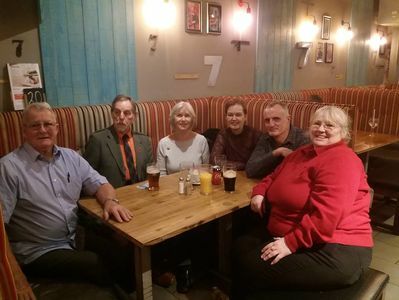 Impromptu Fife reunion in the Seven Kings, Dunfermline on January 12th 2019. From left to right, Colin Ritchie Anderson, Tony Taucher, Lynne Copping, Kim Mason, Jonathan Frost and Deborah Allen. Not in the photo as we met up with him later was Peter Coleman. It was lovely to meet up.